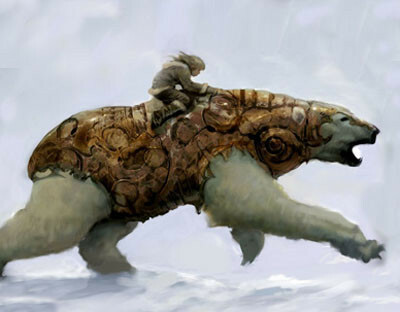 No, I didn't get to ride to the Odeon on the back of a giant Ice Bear but I did get to stroke the softly quivering nuzzle of Iorek Byrnison as he stood outside Tobacco Dock growling and shuffling under the watchful eye of his gyptian lady hander. He might have been growling at the hair-rising antics of the “aerobat” carrying out intricate acrobatics as she dangled from her flying globe above him, or perhaps he was just pleased to see me. After all, I had cheered and clapped him on the big screen at the climax of his mighty confrontation with Iofur Rakinison. Now I realise that it is a little odd to applaud a film and even odder to clap and cheer what is in reality a giant animated teddy bear but the fact that I, and lots of the people sitting around me in the Odeon Leicester Square, did just that is a tremendous testament to how the film of The Golden Compass brings the world of the ice bears to life. The audience couldn't help but identify with Iorek Byrnison in his desperate fight for his life, the life of his young mistress Lyra and his lost crown. We all loved the gruff, abrupt and magnificent Iorek, quite overlooking how much like Sir Ian Mckellen he sounded, when he wasn't shaking the cinema with his ear-curdling roars. I had been invited to the premier by my good friend Ileen Maisel, who is one of the executive producers of the film, and it was quite an evening. It's a strange feeling to walk down that red carpet with crowds of film-fans watching. Just above the entrance to the cinema three large gas flares had been mounted. They cast intermittent flickering flashes of light across the darkness of the square, and every minute or so each of the flames exploded in sequence with a loud crack. It sounded like the deep throated boom of an enormous drum. Their thumping background track made the whole experience quite surreal. I mean, I go to my local multiplex quite often, and I never normally have to have a path cleared through cheering crowds by phalanges of red-jacketed security guards. Believe me it adds a whole new dimension to the simple ritual of “going to the pictures”. Now don't misunderstand me, Eva Green, Daniel Craig, Nicole Kidman and Dakota Richards got the really nerve-racking cheers, but I think the crowd outside just liked cheering everyone who walked passed. The forest of long-lensed digital snappers clicked and clattered incessantly as all the guests sauntered nonchalantly into the foyer pretending, at least in my case, that hordes of photographers, lining up to watch us walk into a cinema are an everyday occurrence. Before the film started Chris Weitz stood up in front of the screen and introduced some of the team who make the film work. And among them we got our only chance to see Pantalaimon's voice (Lyra's daemon), wearing a smart yellow jumper. It was rather like a graduation ceremony back at my university with Chris in the role of Orator. He told us who was coming on next to join the line and what that person had done to help make the film. And we the audience clapped each one in turn as they walked in front of the towering Odeon screen to join the line-up. And you know what? It's surprising how small actors really are when they stand in front of that big, big screen, instead of being projected on it. But despite not being projectorially enlarged Eve Green and Nicole Kidman were gorgeous, Daniel Craig looked just a tweeny-weeny bit menacing (but perhaps that's because I kept expecting him to behave like James Bond) Stan Elliot was over-poweringly super-hairy and Dakota Blue Richards smiled so sweetly she melted the heart of every father who is lucky enough to have a daughter. It made for an electric atmosphere in the theatre as the film-makers trooped off, the microphone was whipped away, the lights dimmed and the curtains slowly opened. The excitement and pace of the story kept building steadily as Mrs Coulter and her children-Gobblers captured more and more of Lyra's friends and Mrs Coulter then even managed to con the kindly Master of Jordon College to hand Lyra over. The Nordic land of the Ice Bears was cold and icy, and the bears superb in their glistening armour. The battle to be King of the Ice Bears was magnificently created. The techie in me particularly admired how the claws of Iorek's paws gouged into the ice surface as he desperately scrabbled to regain his footing. It was better than my internal visualization when reading Northern Lights and as I said earlier it left me cheering and clapping Iorek on. In my opinion it's a magnificent, exciting action film. At just under two hours it's not too long for kids to sit though, yet long enough for adults to enjoy. It captures the excitement of Northern Lights and the special effects make Philip Pulman's strangely different world of daemon souls, high-flying witches, wandering water gyptians, over-the-top-hairy ballon-riding Texans and stupendous armoured Ice Bears come alive in a spectacular manner. 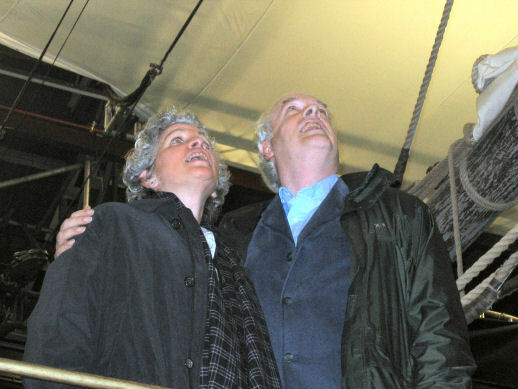 Executive Producer Ileen Maisel and Robert admiring the mast amd sails of the Gyptian ship during the filming of the Golden Gompass.